Good morning all readers, today continues the medium dog breeds recognized by the American Kennel Club with the pictures and descriptions for each trying to locate that perfect doggie for you. 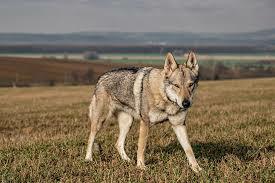 The Czechoslovakian Vlcak, also known as the Czechosiovakian Wolfdog, and a relatively new dog breed, originated from an experiment in breeding conducted in Czechoslovakia in 1955 as a breed to work border patrol. This breed of primitive canine resembles a wolf in appearance, standing 23.5 to 25.5 inches at the withers, weighing 44 to 57 pounds, and having a life expectancy of 13 to 16 years they have three distinct colors silver/gray, gray, and yellow/gray. They are highly intelligent, powerful, lively, fearless, sociable, active, quick, courageous, loyal, and devoted to their owner. Their superior eyesight, hearing, and sense of smell is greater than other canines and they are known for having excellent stamina and endurance. Currently, the breed is being used in Europe and the United States for search and rescue, tracking, obedience, agility, drafting, herding, and working dog sports. Bred for versatility and hardiness in harsh elements they are more independent in nature than the other working breeds. An excellent choice for tracking or trailing of sports or work, but as a companion, they are great for active owners who spend time doing outdoor activities such as biking, running, or hiking. Not a breed for families with children and not, however, recommended for first time owners, this breed is a companion dog to any outdoorsman who wants a loyal and faithful companion. 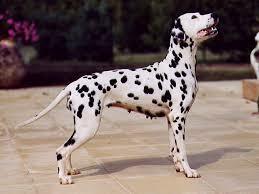 The dignified Dalmatian breed originated in Croatia and its historical region of Dalmatia, they were mainly used as a carriage dog accompanying the horse-drawn rigs of nobles, gypsies, and firefighters in the early days. Dalmatians are a medium-sized breed standing 22 to 24 inches at the shoulders, weighing 35 to 71 pounds, and having a life expectancy of 10 to 13 years, the eye-catching spots of black or liver on the short white coat makes them one of the most distinctive in the dog world. Originally they were bred to guard the horses and coaches and today you will still find they carry the protective instinct in their temperament. 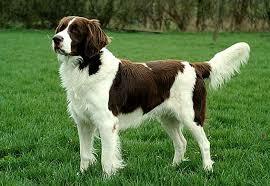 With their reserved and dignified attitude, they can be aloof with strangers and make a dependable watchdog. Dalmatians are intelligent, energetic, outgoing, sensitive, playful, active, friendly, gentle, social, protective, and relatively a non-aggressive breed. Usually, the will be patient and good with children and can be protective of their preferred humans. Being strong and active athletics with great stamina they make a great partner for runners and hiker of all ages. The Deutscher Wachtelhund is, in fact, the German Spaniel and originated in Germany around 1890, the breed is a scent tracking hunting dog. Being of medium build the Deutscher Wachtelhund stands 18 to 21 inches at the shoulder, weighing 40 to 55 pounds and having a life expectancy of 10 to 14 years. This docile, lively, intelligent, passionate, friendly, and versatile hunting dog comes in coat colors of a white, fawn, liver, brown, brown road, gray, and red, usually with white markings. This versatile breed is known for its scenting and blood tracking ability comparable to a Bloodhound and can track 40-hour-old wounded game, with fresh game it will vocalize informing hunters of its location. This breed is virtually unknown to the German non-hunting public, brought to the United States and Canada by a few hunters they have been known to be used in Canada to hunt black bear and in Sweden to hunt wild boar. They are not very popular outside of Germany but for a family dog with children because the breed does not spook easily and confident nature they will be fine. The Drentsche Patrijshond originated in the Netherlands from a Dutch province of Drenthe, the breed is a versatile spaniel-type hunting dog, known as the Dutch Partridge Dog in English. Drentsche Patrijshond, pronounced da’rinse-ah puh’trice-hoon, called a Drent for short, is not a typical continental pointer first of all the Drent has a tail and is nearly four hundred years old. With a medium stocky build standing 21 to 25 inches at the withers, weighing 48 to 73 pounds, and having a life expectancy of 11 to 14 years, the Drent was built by farmers for farmers. Drents had to do it all around the farm including keeping it clear of vermin, cart dairy to the market and be able to hunt feather and fur plus much more. 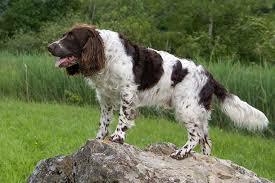 The medium length coat has three colors orange & white, brown & white, and tricolor. Drent’s hunting abilities are excellent for hunting a variety of game including that of a retriever in waterfowl, he will keep the hunting partner appraised of his journey but will keep watching to make sure he is not too far behind waiting along the trail for him to catch up and is vocal along the way. Due to his vocal nature, he will bark to announce visitors at home and will often be reserved towards strangers until they are welcomed into the family. Being highly intelligent and adaptable the training must be kept lively and interesting for the breed and they can be used in all types of agility, tracking, dog sledding, and skijoring. With the soft nature, loyal, fearless, obedient, sweet-temper, and companionable this breed makes a great family dog with children. 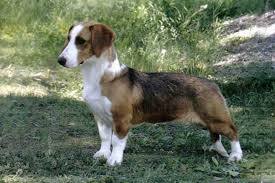 The Drever originated from Sweden and is a short-legged scent hound breed of dog used for hunting deer and other game. A descendant from the Westphalian Daschsbracke, a type of German hound called Bracke, its name was actually chosen through a contest in 1947. Early in the twentieth century in Sweden, the hunters were having difficulty hunting deer and soon realized that the Drever with its robust and strong body but not so speedy short legs could travel over the rough terrain to the herd locations and drive the deer over the distances right to them. Drever gets along well with other breeds and is a good pack dog in groups. Being a short 12 to 15 inches at the shoulders, weighing 31 to 35 pounds, and having a life expectancy of 15 years or more, they come in tricolor, black & white, red & white, and fawn & white short coat colors. Drevers are alert, keen, even-tempered, self-assured, affectionate, playful, and sweet making great family dogs for children they will be very active indoors as well as outside with them. The breed is never aggressive, nervous, or shy and they do well in most living situations but will tend to be vocal when alerting or at play so they will make a suitable watchdog too. 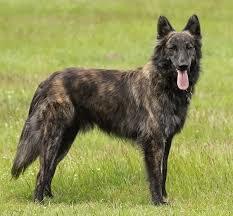 The Dutch Shepherd originated in the Netherlands and is a herding dog of the Dutch, that was used by shepherds and farmers who needed a versatile breed that was able to adapt to a harsh and meager existence, with few demands. Having retained its herding breed instinct this dog has an independent nature and can be obstinate and have a mind of its own, guarding the flocks of sheep in a particular location all day makes it able to run endlessly showing its lively athletic abilities. Its medium build of 22 to 24 inches at the shoulder, weighing 65 to 67 pounds, and having a life expectancy of 12 to 14 years, the medium length coats come in a variety of colors brindle, silver brindle, gold brindle, salt & pepper, gray brindle, and blue-gray. Dutch Shepherds are not a widely known breed but are a loyal companion and competent working dog used for obedience, dog sports, herding, tracking, search and rescue, guard dog, drover, livestock, and as a police dog. With their affectionate, loyal, alert, obedient, reliable, intelligent, and adaptability these make a great family pet. The breed will remain calm when indoors and be very active and want to run when outdoors so it is recommended you have room for this breed to run and play when outside. This concludes the list of dog breeds found under the letter “C” and “D” of the alphabet so next time we will be moving on the breeds that start with the letter “E”. I apologize that it is taking so long to get through all the breeds but to research each breed takes time and I would like to provide you will the best information for each one. Thank you for your patience. Well, what do you think of this set of breeds? Any of them strike your fancy for getting one to add to your family? If you have been following along with my adding the breeds to the website then you already know I will take any of them all the breeds have a special look to them and can you imagine the different personalities you could accumulate with them? Sure I am interested in hearing what you think so please leave answers to my questions along with any comments, suggestions, or questions you have for me in the space provided below.